Brandy – a cup or more depending on required strength! 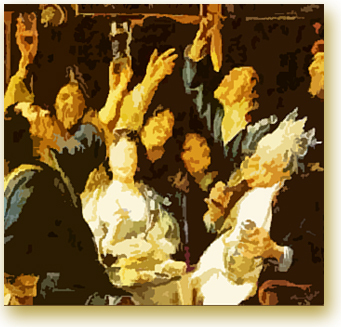 hear an example song of wassail (opens in a new window). This recipe makes enough for about 20 people. Pre heat oven to 180 or gas mark 4. Core the small apples, fill with a teaspoon of brown sugar then insert the cloves into the orange about 5cms apart. Bake the fruit in the oven for 30 minutes. Remove the fruit from the oven and prick the skin of the orange with a fork. Mix the rest of the ingredients together, saving the brandy, into a large container. Ideally it should all be heated together but if you do not have a saucepan large enough you can heat it in batches. Once heated, strain the mixture and serve into metal punch bowl. Add the brandy. Float the fruit on top and ladle into mugs or punch cups. Throughout Christmas carols and literature there are references to people going wassailing, or drinking wassail but not everybody knows what it is or where it comes from. 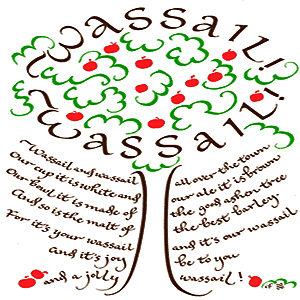 The word “Wassail (pronounced woss ail) comes from the Anglo Saxon greeting waes hael which translates as “be well or be whole. This expression has been used as a greeting over the years, to people out in groups visiting or singing at households where they are offered a mug of warm spiced cider or ale on a cold winter’s night over the Christmas period. The dictionary entry reads Wassail 'A riotous festivity characterised by much drinking’. That certainly got my attention. Traditional Wassail song, which dates from the 17th century.